Fantastic location, spacious rooms and friendly staff. 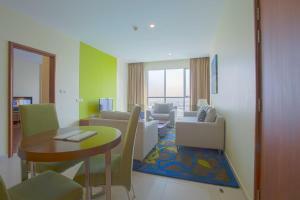 The location is great for people planning to spending some time in Dubai downtown and its attractions. It's an 8 minute walk to Dubai Mall and Burj Khalifa. The view is simply stunning, you can see the dancing Dubai Fountain from most apartments. Some apartments have an incredible Burj Khalifa + Fountain View. So I wasn’t planning to complete the week there and i extended my stay 3 extra nights from how nice the stay was. I could just walk to the mall and even if im tired from my shopping i could just take a v cheap taxi. Or even stay watch the fountain from the room 😂. V convenient rooms for families & best money value. Location worth every penny and v good compared to a 4 star hotel The staff are just more than great The receptionist HAmada is the best he gave us a free upgrade Best view and good breakfast. Just cant ask for more with this value of money. I 100% liked the room, the view, and the location. So close to the center. We could see the tower and the fountain show from our window! The staff was super helpful and nice. Hamada at the reception desk was so great to meet our requests. The gentleman that organize the trips suggested us the best things to do in two days, that we feel we did a lot. Akbar was very helpful with directions and translating to taxi drivers. He was courteous, helpful and a real asset to your organization. I liked the comfort of the room with its great views. Location was excellent and all the staff were very helpful and affable. I would love to go back there again. 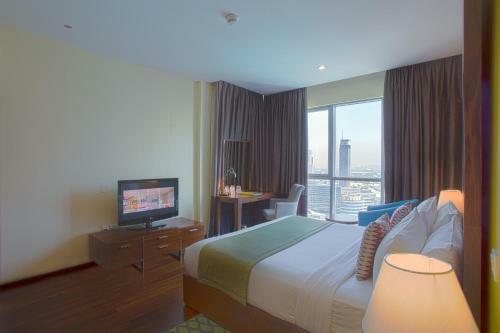 Lock in a great price for Ramada Downtown Dubai – rated 8.2 by recent guests! Ramada Downtown Dubai This rating is a reflection of how the property compares to the industry standard when it comes to price, facilities and services available. It's based on a self-evaluation by the property. Use this rating to help choose your stay! 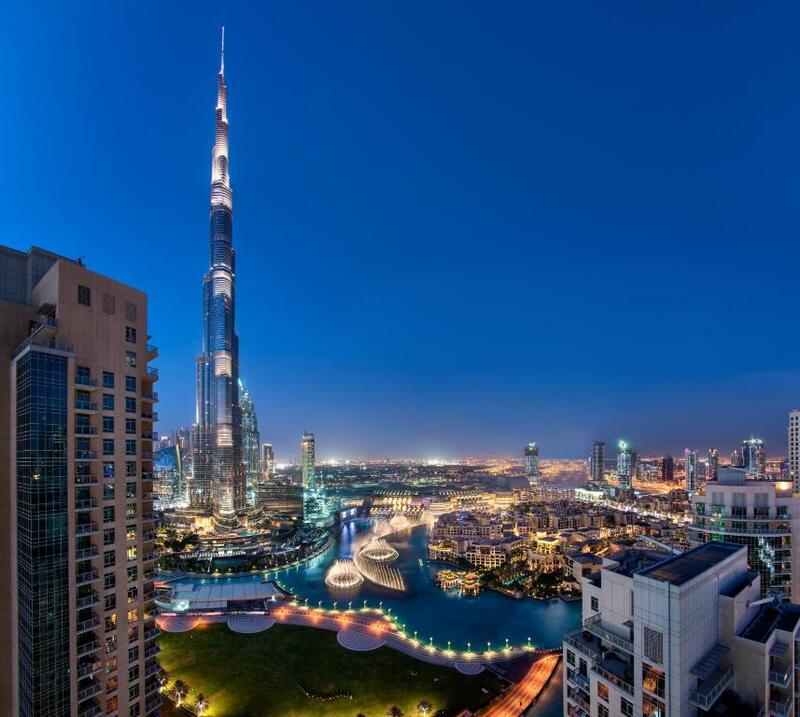 One of our top picks in Dubai.Ramada Downtown Dubai is located in downtown Dubai, overlooking the Burj Khalifa and Dubai Fountain, and is situated right next to Dubai Opera. It is just 10-min walk to Dubai Mall and Souk Al Bahar and a short drive away to Emaar Business Square, Media City, DIFC, Health Care City, Internet City and World Trade Centre. It offers free shuttle service to Jumeirah Beach Park, Dubai Mall, and the Metro. Free WiFi Is available throughout the property. Guests can enjoy downtown living in 181 suites comprising of studio rooms, one and two-bedroom suites and a magnificent penthouse. Rooms are spacious starting from 60sqm with elegantly designed interiors touched by bright accents and are fully furnished with fully-equipped kitchen, dishwasher, and laundry facilities for home-like convenience. Interconnecting rooms have been designed to accommodate bigger families and groups, and accessible guest rooms for physically-challenged guests. All of the suites have a full kitchen and a private bathroom with a rain shower. Facilities include temperature-controlled outdoor swimming pool, gym, steam room, badminton court, kids’ pool, and children’s outdoor and indoor play areas. The all-day dining restaurant kenza serves Mediterranean favorites and a wide-range of selection from our international cuisine, and Room Service is available 24 hours. The meeting rooms are complemented with the latest in technology with business center facilities. 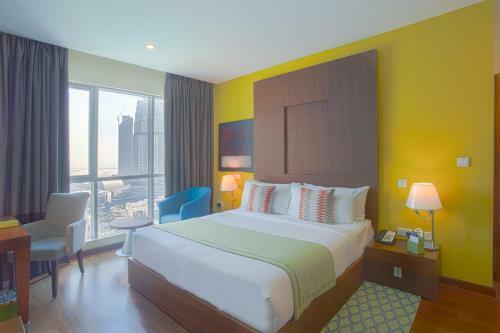 Ramada Downtown Dubai is less than a 5-minute drive from the Dubai International Financial Centre, Convention Centre and Dubai World Trade Centre. The Jumeirah Beach is 25 minutes' drive away. 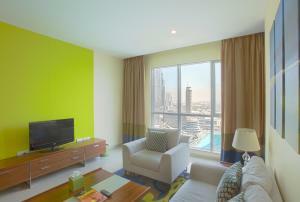 뀐 Located in the real heart of Dubai, this property has an excellent location score of 9.0! 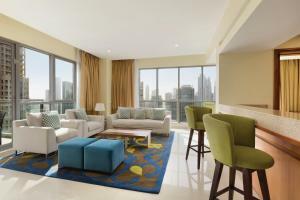 When would you like to stay at Ramada Downtown Dubai? A large studio-type suite overlooking the Burj Khalifa and The Dubai Fountain, spanning as much as 60 sqm providing more space than any standard deluxe hotel room. 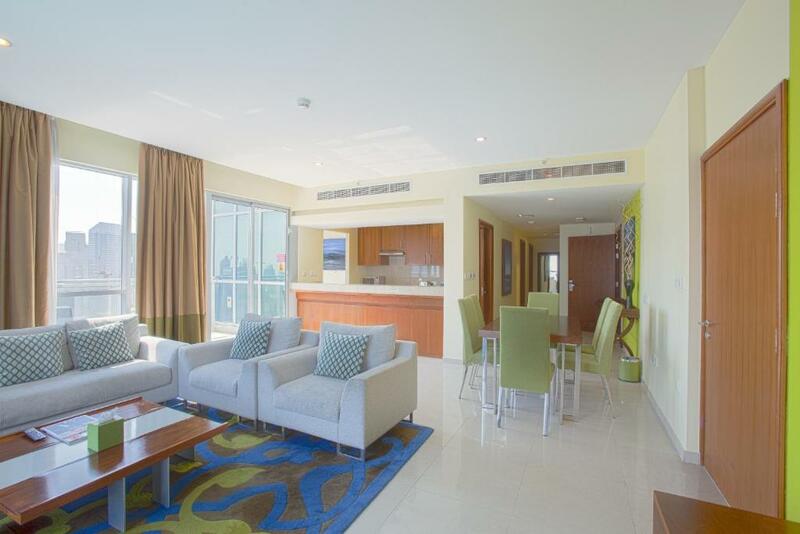 A spacious suite measuring 80 to 100 sqm with contemporarily designed interiors, overlooking the Business Bay and featuring a balcony, separate living room and kitchenette. 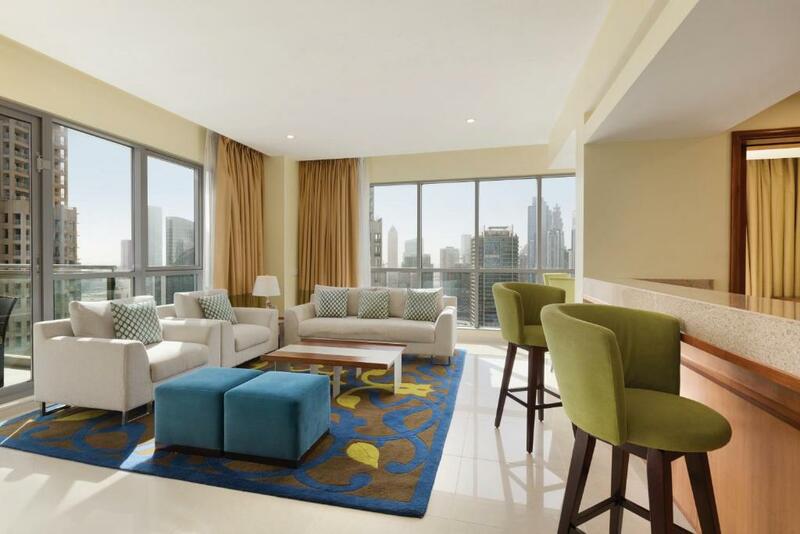 A spacious suite measuring 80 to 100 sqm with con temporarily designed interiors, overlooking the Business Bay and featuring a balcony, separate living room and kitchenette. A spacious suite in contemporary interior measuring 130sqm with a large stationary window that lets in the maximum amount of light and the magnificent view of the Burj Khalifa and the Dubai Fountain. It can accommodate up to 4 adults and 2 child with king and twin beds. It has a separate living room with 6-seater sofa set and an LCD 32” plasma TV, and a separate toilet. The room provides the comfort of one’s home with complimentary Wi-Fi access for 4 devices, a fully-equipped kitchen with counter top complete with kitchen utensils, a 6-seater dining table, 2-seater coffee table, a laundry and dryer area. The 2 separate bedrooms are complete with working desk, large wardrobe, luggage rack and separate LCD 32” plasma TV. The master bedroom has a large bathroom with walk-in shower and a separate bathtub complete with toiletries and sets of linen. All units have balcony to provide more space for relaxation. This suite features a oven, iPod dock and spa bath. This suite has a fireplace, oven and iPod dock. This suite features a oven, fireplace and spa bath. This suite has a iPod dock, oven and fireplace. This twin room features a oven, iPod dock and spa bath. This twin room has a oven, spa bath and fireplace. This suite features a oven, fireplace and iPod dock. This suite has a oven, fireplace and iPod dock. This suite features a fireplace, iPod dock and oven. This suite has a satellite TV, fireplace and iPod dock. This suite features a iPod dock, fireplace and oven. Located in the most popular district, Ramada Downtown Dubai offers spacious accommodation with vibrant interiors and amazing views of Burj Khalifa and the Dubai Fountain. A 10-minute walk to Dubai Mall and Souk Al Bahar, highly accessible from the International Airport and prominent business districts like World Trade Center, Internet City and DIFC. The hotel showcases dining, health and recreational facilities, free WiFi, kids’ club & modern meeting amenities. Our guests may experience the luxury of downtown living in 181 suites comprising of studio rooms, one and two-bedroom suites and a magnificent penthouse. Rooms are spacious starting from 60sqm with elegantly designed interiors touched by bright accents and are fully furnished with fully-equipped kitchen, dishwasher, and laundry facilities for home-like convenience. Downtown Dubai is the city's most sought after business and leisure destination, offering a host of activities, event venues, and world class experiences. The Downtown Dubai community is called The Centre of Now, aptly because residents and visitors always have something new and exciting to look forward to. Area Info – This neighborhood is a great choice for travelers interested in restaurants, luxury brand shopping and clothes shopping – Check location Excellent location – show map Guests loved walking around the neighborhood! 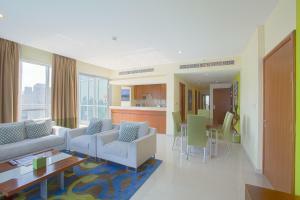 House Rules Ramada Downtown Dubai takes special requests – add in the next step! Ramada Downtown Dubai accepts these cards and reserves the right to temporarily hold an amount prior to arrival. Please note that Ramada Downtown Dubai does not serve alcohol. The hotel is with perfect location,very kind staff and clean.I recommend it. I love the location and the staff was very willing to help . Loved the location. Suite was lovely. Some extra cups and plates would be nice though.